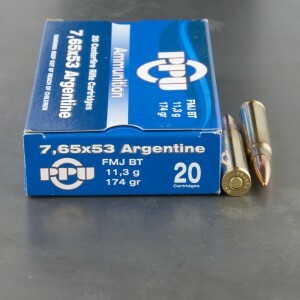 7.65 Argentine ammo is also known as 7.65x54mm Argentine rimless, 7.65mm Argentine, 7.65x53mm Belgian Mauser or 7.65mm Belgian (in the United States) and 7.65x53mm Mauser (in Belgium). The round itself is a centerfire, rimless, bottle-necked, .313 caliber, rifle cartridge originally developed by Paul Mauser for use in the model 1889 Mauser Bolt Action Rifle and both rifle and cartridge were adopted by the Belgium military in 1889. Then, shortly thereafter, the round was also adopted by several South American countries and it served the Argentinean military for almost 100 years from the late 1800's until its service was discontinued in the late 1970's. 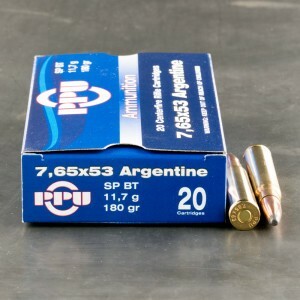 This ammo feeds and ejects smoothly. No excess pressure signs. Excellent accuracy in my sporterized 1909 Argie. The ammo is excellent , always a smooth shot.